Us (film, 2019). A 2019 American psychological horror-thriller film with "R" rating by Universal Pictures. Directed by Jordan Peele. Official Trailer. Us is a 2019 American psychological horror-thriller film directed by Jordan Peele. 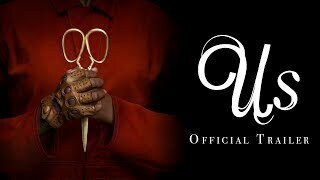 Us - Official Trailer . Husband and wife Gabe (Winston Duke) and Adelaide Wilson (Lupita Nyong'o) take their children (Evan Alex and Shahadi Wright Joseph) to their beach house, hoping to spend time with friends. Their serenity soon turns to tension and chaos when a group of strangers (referred to as 'The Tethered'), who look exactly like them, arrive. Principal photography began on July 30, 2018 in Santa Cruz, California, including the Santa Cruz Beach Boardwalk. The film Us was scheduled to be released by Universal Pictures on March 8, 2019 (SXSW), on March 15, 2019 (United States), on March 20, 2019 (France), on March 21, 2019 (Germany) and on March 22, 2019 (United States, United Kingdom). The duration of the film is 116 minutes. The film's budget is $20 million. Us got high rating from critics. The audience also likes the film. Audiences polled by CinemaScore gave the film an average grade of "B" on a scale ranging from A+ to F.